Ⓐ Switches off the windscreen wiper. Ⓑ Interval wipe for the windscreen. Ⓔ x Flick wipe – wipes briefly. Push and hold the lever down for longer to wipe more quickly. Ⓕ Pulling the lever activates the wash and wipe system for cleaning the windscreen. Ⓖ Interval wipe for the rear window. The windscreen wiper will wipe the window approximately every 6 seconds. Ⓗ Pushing the lever activates the wash and wipe system for cleaning the rear window. ① Set the interval lengths with the switch (vehicles without rain sensor) or adjust the sensitivity of the rain sensor. If the ignition is switched off while the windscreen wiper is still switched on, the windscreen wiper will continue to wipe on the same setting when the ignition is switched on again. Frost, snow and other obstructions on the windscreen can cause damage to the windscreen wipers and wiper motor. Carefully detach wiper blades that have become frozen onto the windscreen. Volkswagen recommends using a de-icer spray for this. Do not switch on the windscreen wipers when the window is dry. Using the wipers when the windscreen is dry can damage the windscreen. 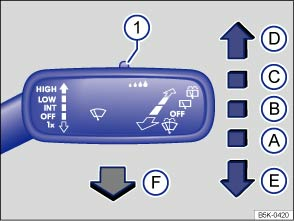 The interval wipe for the windscreen depends on the speed of the vehicle. The wipers will wipe more frequently as the vehicle moves faster. 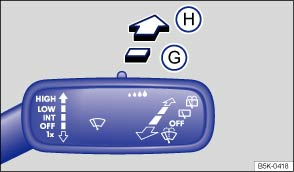 The automatic switch-on function when in reverse gear can be activated and deactivated using the button and the and Mirror and wipers function buttons in the infotainment system .